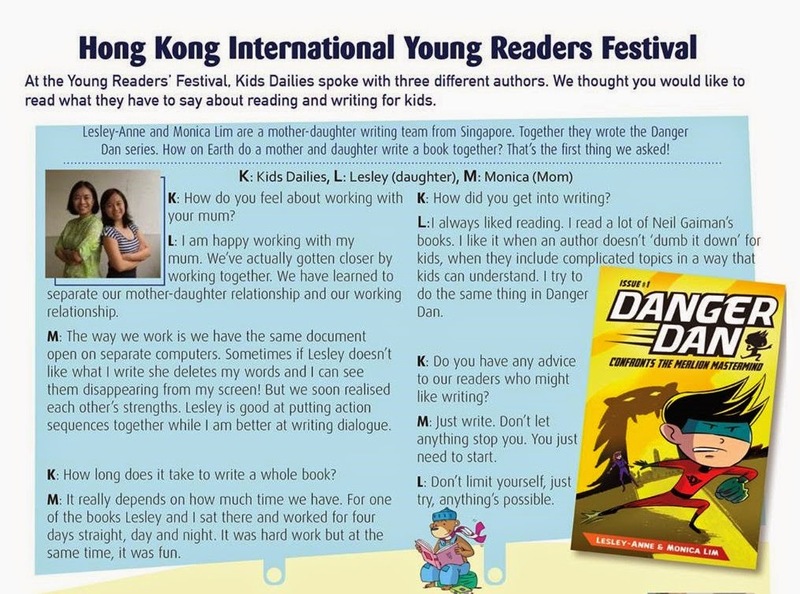 Lesley-Anne and I are co-authors of the newly launched children's book series Danger Dan and I'm also the author of The Good, the Bad and the PSLE. As authors, we were both invited to Hong Kong to participate in the Hong Kong International Young Readers Festival. It was a whirlwind speaking tour - four talks and one workshop within two days! Part of the reason why it was such a rush was because over-achiever Lesley-Anne has a ballet exam this week and she insisted on flying home in time for the last lesson before the exam. I decided to write about Hong Kong in two posts - this one is on the talks we did and the next one will be about... the food! (Cos we all know that's a very important aspect of travel and deserves it own post). We flew into Hong Kong late on Thursday night. By the time we reached the hotel, it was almost midnight so all we did was take a shower and crawled into bed.The next morning, we were up bright and early for breakfast as I had to be at Radio Television HK for a 9am interview. This was followed by an interview with Sing Tao, one of HK's main Chinese newspapers. Then we were chaperoned to our very first talk. This was a lunch talk sponsored by Mayer Brown JSM, a posh law firm at Central, HK. 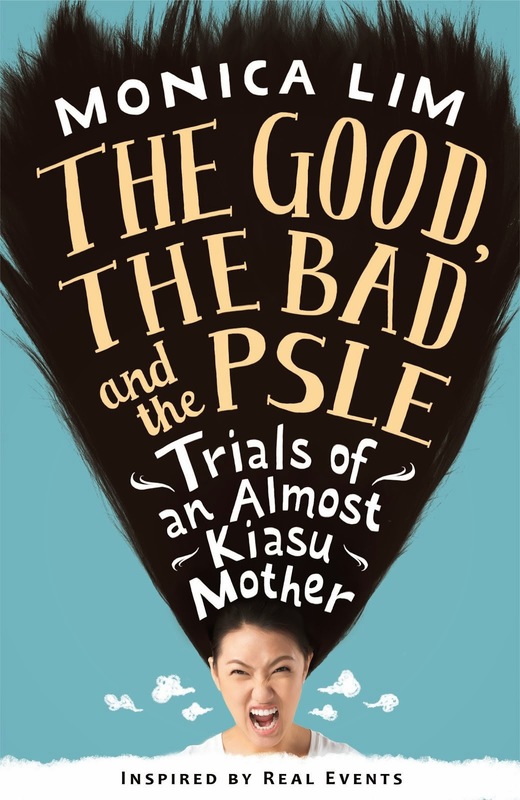 Mayer Brown JSM had invited their clients to hear me talk about my book The Good, the Bad and the PSLE and writing with Lesley-Anne. Together with some of their staff, the attendees numbered 40 or so. The host, Gabriela was very sweet and reassuring but I was a nervous wreck. Lesley-Anne was seated at the head table with me and she saw my hand shake as I was holding the microphone. Glory of glories, I got through the presentation and no one fell asleep. In fact, they all seemed rather interested and laughed at my jokes. Many of the audience members were parents and they started asking questions about the difficulties of navigating the education system (HK's system is remarkably similar to Singapore's) and parenting in general. And then... something miraculous happened. For some reason, I wasn't nervous when answering questions. I shared my views and philosophy, and how we often have to hold on to our beliefs even when society tells us otherwise. I shared my own experiences with Lesley-Anne and Andre. The audience listened. And when the session ended, Lesley-Anne whispered to me excitedly, "You made them cry! I saw three people cry!" A man stood up and asked, "Is there a recording of this session? I ask this because my wife is a Tiger Mum and she needs to hear this." Another lady to whom I'd earlier confessed that I hated public speaking told me, "If you're a bad speaker, then your book must be really incredible cos that was a wonderful talk!" Oh wow. Cannot believe it. The reason I write this is to share with you (and remind myself) something a friend said to me before I'd left for Hong Kong - "God equips the called." Indeed. I think it's extremely comforting to know that if God has a reason for wanting you to do something, He will enable you to do it. It's truly a lesson in faith. Mayer Brown JSM had generously bought The Good, the Bad and the PSLE for all the attendees. Here I am, autographing the books. (I deliberately chose a photo where you can't see faces, for privacy reasons). The outcome of that talk did wonders for my self-belief and that much needed cos the very next talk was at a local school - Po Leung Kuk Ho Yuk Ching (1984) College, where we spoke to 270 13-15 year-olds. We were warned that local students in Hong Kong are very reserved but we were not prepared for just HOW reserved they are. I mean, I was so thankful that we had just done a similar talk at St Hilda's Primary the day before and we got lots of laughter and applause so we knew the content of the talk was just fine. Cos what we got at the HK school was... silence. It's a little unnerving to not receive a response to any joke. Possibly it was due to their command of the language (English is their second language). Maybe they didn't really understand us even though we spoke slowly and didn't use complex words. Or maybe they're just very shy. 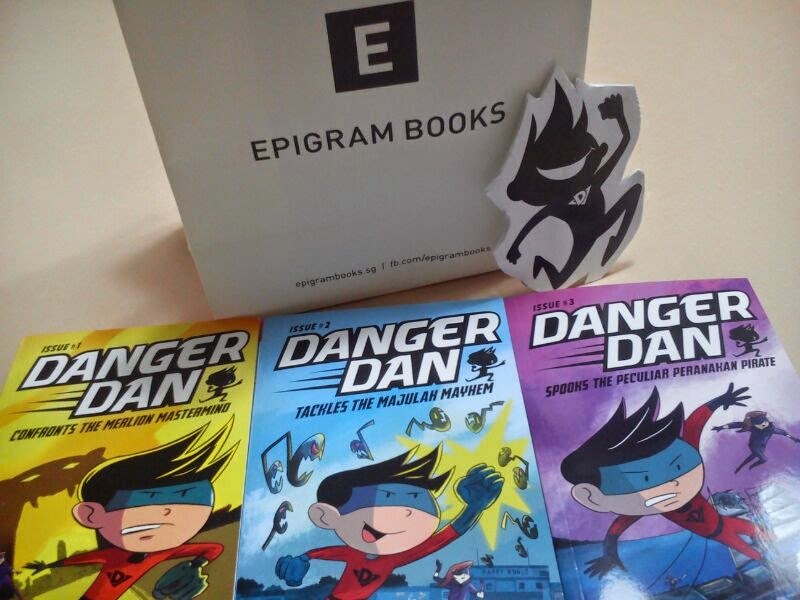 Anyway, the eagerness of the teacher made up for it - she was very welcoming and even bought a copy of Danger Dan for us to autograph. We conducted a creative writing workshop for kids and it's a world of difference when you deal with international school kids. These kids were vocal, participative and extremely imaginative. We were astonished at how imaginative they were and how much they could write within a short period of time! We had so much fun conducting that workshop. A parent later told us it sounded like the kids really enjoyed themselves cos she heard a lot of laughter from the room. Lesley-Anne was a panelist in a public session called Becoming A Writer which featured young writers. The moderator was Jennifer Wong, a poet and on the left is Anna Ginsburg. I was part of a panel discussing parent-child relationships called Growing With Your Children, with Reenita Malhotra and Theadora Whittington, moderated by Crystal Kwok of Radio 3. Finally, we were also interviewed by Daily 7/Daily 10 which is a kids' newspaper. 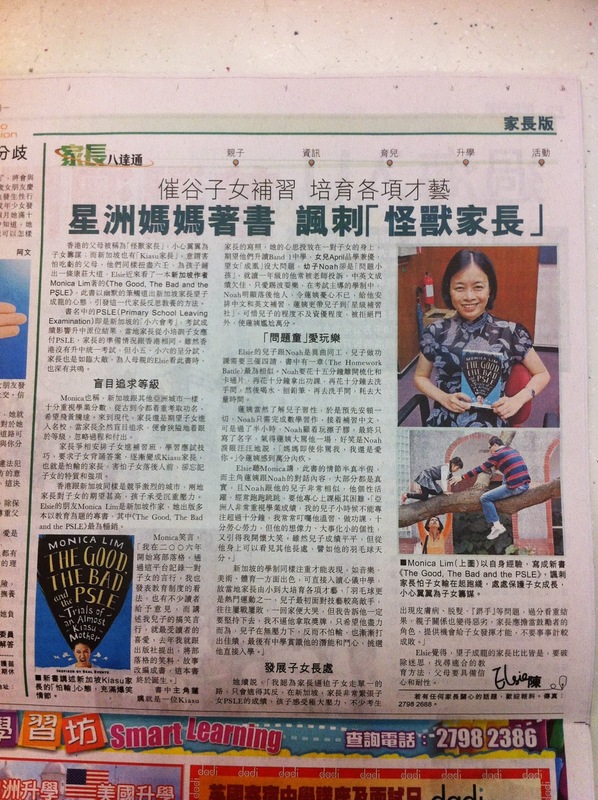 The Hong Kong press has really been very supportive of us and our books, especially The Good, the Bad and the PSLE. South China Morning Post did an extensive interview with me that was published on 11 March 2014. You can read the article here. Sing Tao also wrote a feature on me on 31 March 2014. You can read the article here. 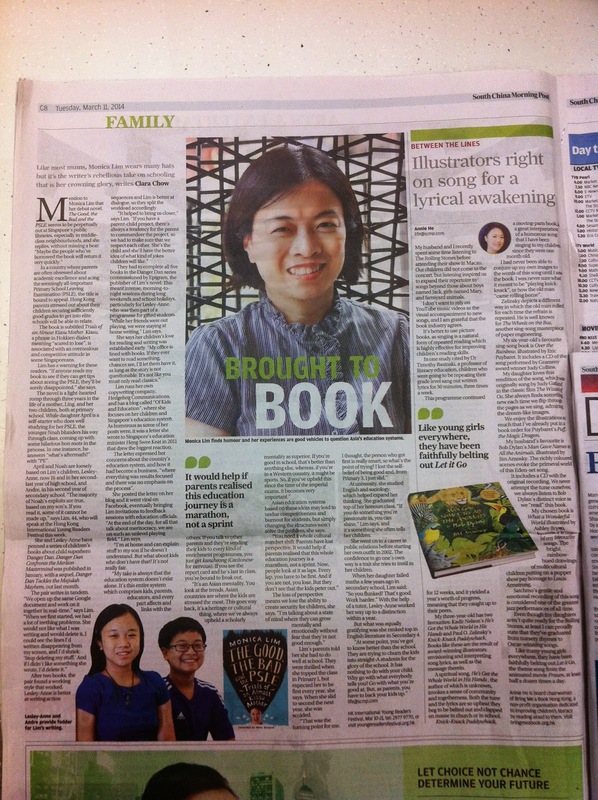 Perhaps in time, our books can be distributed beyond Singapore's shores. A dream to hold on to!